Our Parking Garage is Famous! It’s impossible to miss the enormous and striking parking garage attached to EC Miami’s building. This concrete parking garage by the firm Herzog & de Meuron has won awards for its architecture, and it is much more than just a garage. It is also home to a few stores, it is used as a venue for many parties and events, and it even has a penthouse apartment! 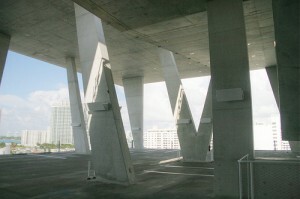 The 1111 garage has also been shown in television series and advertisements and many people now recognize it as a Lincoln Road and South Beach landmark. Best of all, EC Miami is right next door! In the most recent issue of the well-known magazine, Vanity Fair, there is an entire article dedicated to the 1111 parking garage. It gives you information about our garage, as well as the architectural firm Herzog & de Meuron, which also designed the Bird’s Nest for the Beijing Olympics. If you would like to learn more about the garage click here to read the entire article. For our students who don’t already know, there is a fantastic view from the top floor of the garage and you don’t need to park there to see it. Everyone who studies at EC Miami, or visits Miami for any reason, should spend at least one evening watching the stunning sunset over Miami Beach from the top of this iconic parking structure.